Economic growth means an increase in real GDP – which means an increase in the value of national output/national expenditure. 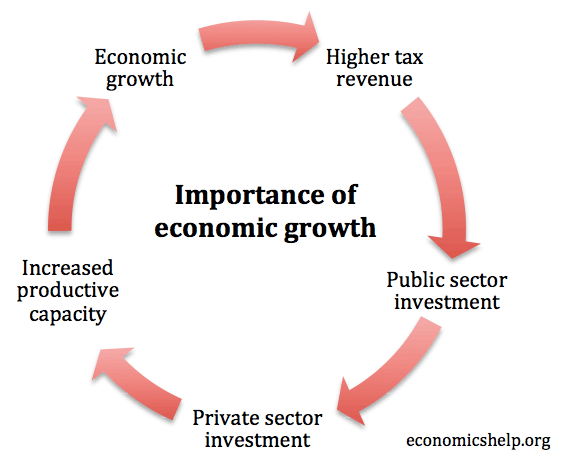 Economic growth is an important macro-economic objective because it enables increased living standards, improved tax revenues and helps to create new jobs. 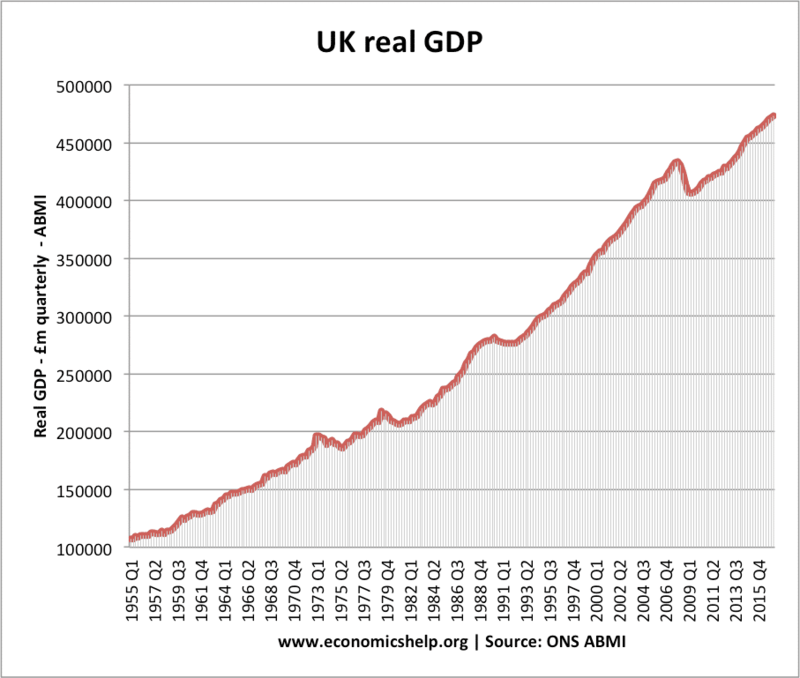 UK real GDP since 1955. 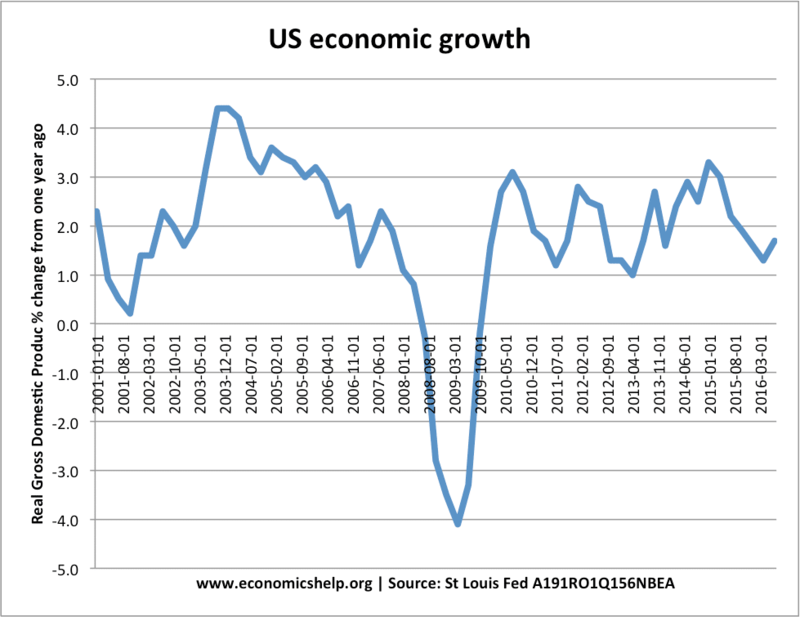 Showing sustained a rise in national output (despite brief periods of negative economic growth). Economic growth is caused by rising demand and an increase in productive capacity. 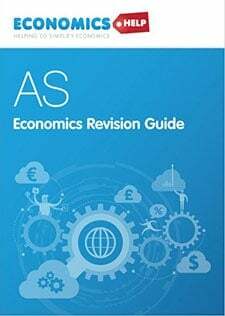 An increase in aggregate demand AD=(C+I+G+X-M) – a rise in consumption, investment, government spending, exports – imports. 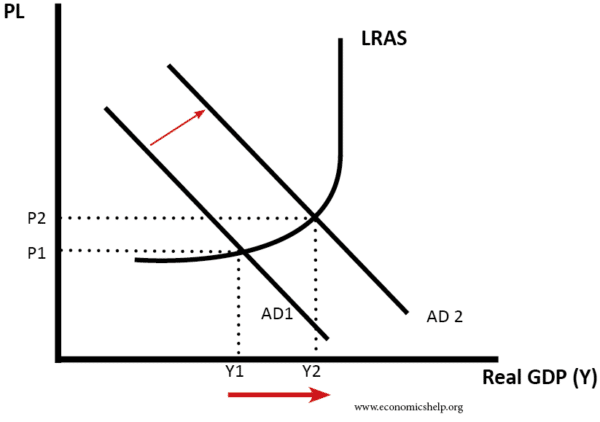 In this diagram, we have an increase in aggregate demand (AD) and an increase in long run aggregate supply (LRAS). 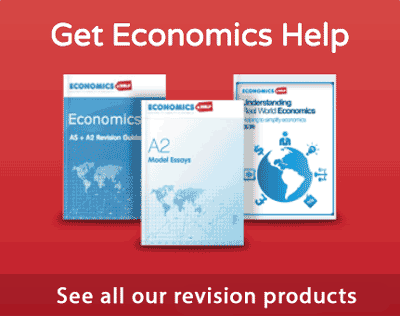 This enables a rise in real GDP – without causing inflation. If the Central Bank cut interest rates, this would provide an incentive for firms to invest (borrowing would now be cheaper). This investment is a component of AD and AD will rise. WIth higher investment, more people will be employed, and there is a purchase of raw materials. Also, the cut in interest rates will encourage consumer spending due to lower borrowing costs and lower mortgage repayments. This will cause an additional rise in AD. The investment will also lead to an increase in productive capacity (LRAS) with firms gaining more capacity to meet demand. A key factor in enabling economic growth in the long-term is productivity. 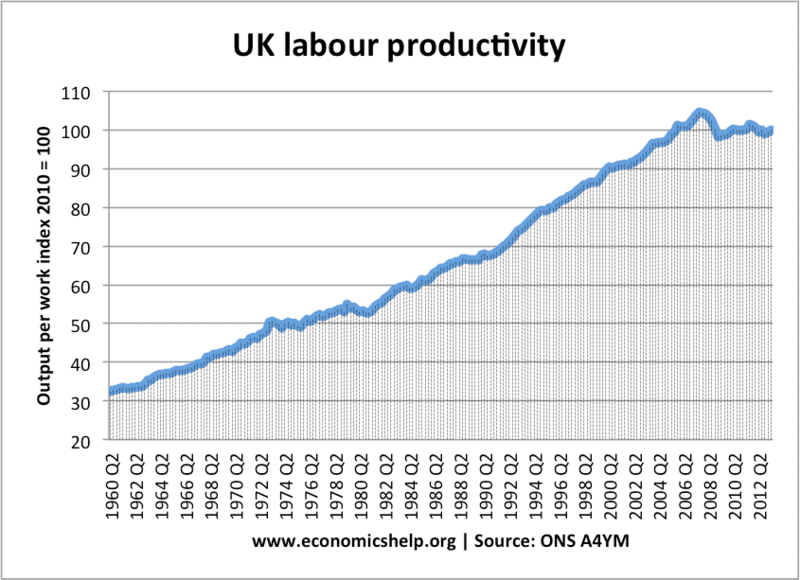 Productivity is output per worker. If there is the development of new technology (computers, machines), it means workers will be able to do produce more. This growth in output per worker is a key factor behind economic growth. Reduce red-tape and bureaucracy which raises costs for firms. Reducing interest rates to stimulate economic activity and increase AD. Lower interest rates reduce the cost of borrowing. This encourages households to spend. Also, it is cheaper for firms to finance investment so investment should rise. If successful, lower interest rates should increase aggregate demand, and in the long-term, increase long-run aggregate supply. However, lower interest rates may not always cause higher growth. If confidence is very low, firms may still be reluctant to invest. Also, there is a limit to how much monetary policy can increase growth. If the economy is close to full capacity, then rising AD will cause inflation and the growth will be unsustainable. 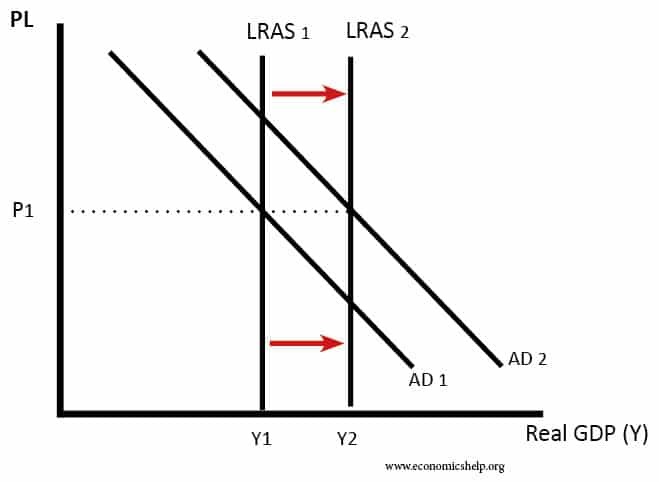 Expansionary fiscal policy involves higher government spending and/or cutting taxes to boost aggregate demand. This fiscal policy will lead to higher government borrowing, which can be a constraint on the policy. 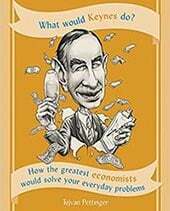 Keynes was an advocate of fiscal policy in a recession. 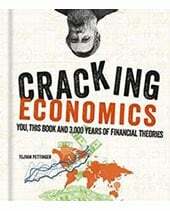 Keynes argued in a recession, the private sector increased their saving ratios and the government needed to intervene. However, monetarists and classical economists are more sceptical arguing expansionary fiscal policy will cause crowding out. Higher incomes for workers and firms. Increased tax revenue for the government which can be spent on public services, e.g. education, pensions and healthcare. Reduced government debt. Higher economic growth usually reduces the government’s budget deficit because of the improved tax revenues. Economic growth Helps create employment and reduce unemployment. Economic growth creates a positive feedback loop. Higher growth encourages firms to invest. Increased investment enables higher growth in the future. Economic growth enables a reduction in absolute poverty. In the past 100 years, growth has helped to significantly reduce absolute poverty in Western Europe, US and recently in Asia. Inflation. If growth is too fast, we could experience inflation. Current account deficit. If growth is unbalanced, we could see a growing current account deficit as people buy more imports. Environmental costs. Economic growth leads to higher resource consumption and pollution. Decline in living standards. Economic growth does not always increase living standards. Higher growth could cause new problems such as congestion, pollution, increased crime, increased dissatisfaction and more pollution. Boom and bust economic cycles. 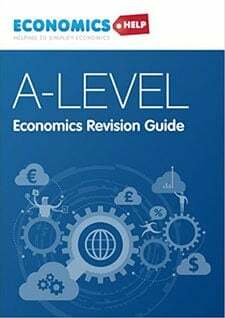 If growth is very fast and inflationary, then the growth will prove to be unsustainable and there will be the costs of the recession and an economic downturn. Export-led growth. Economies such as Japan and China have experienced export-led growth. This enables economic growth and a current account surplus. China has increased its ownership of foreign assets. Consumer-led growth. 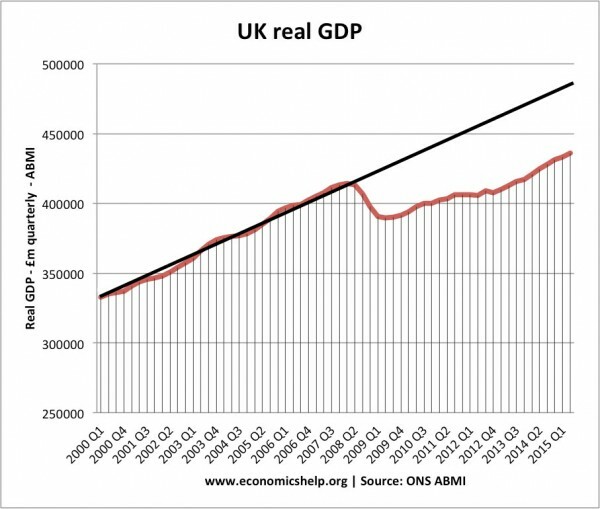 Since 1979, UK economic growth has been more dependent on consumer spending. The UK has run a persistent current account deficit with fears the economic growth is unbalanced. The long-run trend rate is the average sustainable rate of growth over a period of time. The long-run trend rate depends on the growth of productivity and is related to levels of technology and investment. Sustainable growth – growth that is balanced and environmentally sustainable.